This beautiful cascade bridal bouquet is one that I couldn't help but showcase. 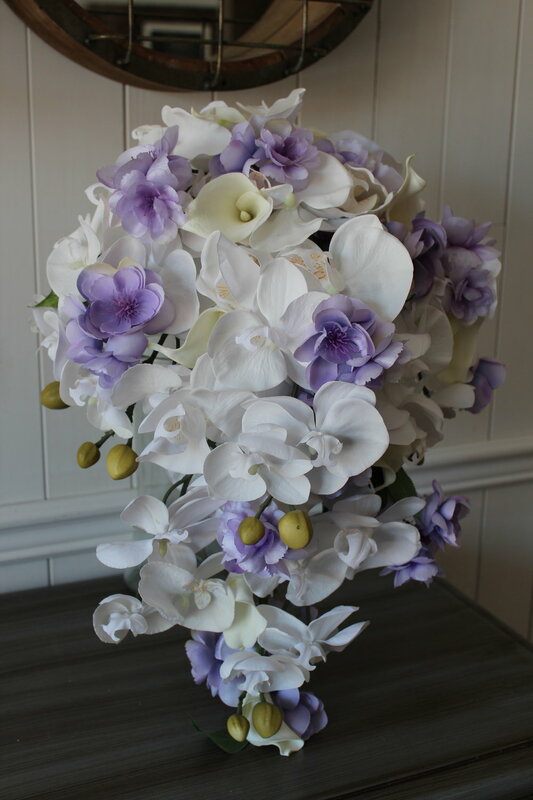 Her requests were simple: cascading orchids with lavender accents. Oh, and don't forget the bling! Phalaenopsis Orchids never disappoint! They are elegant, classic, and always beautiful. And when they are high quality silk flowers, they don't wilt, crush, or turn brown. 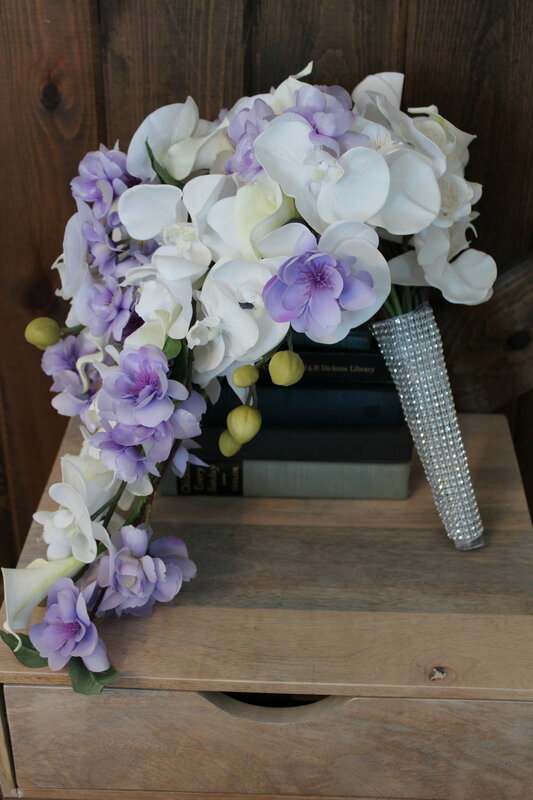 I added some ivory Calla Lilies to fill out the bouquet and then our beautiful lavender blossoms were the perfect touch on this elegant cascade bridal bouquet. I didn't want to go over the top with the bling, so we added a rhinestone wrap to fully cover the stems for that extra wow-factor! Groom's boutonniere and Best Man's boutonniere. Love the look of a cascading bouquet? Hop on over to my blog to see the variety of cascading silk bridal bouquets I've done over the last 13 years. If you already know the look you want, contact me today with your links and photos of your dream wedding flowers. Coral and seems to be one of those colors that is everywhere. And coral and white are just made for each other, which is they are showing up in more 2016 weddings. From the soft and feminine palette, to a more saturated and vibrant tone, it's a classic combination that won't be going anywhere anytime soon. I particularly love Ranunculus, as do many brides, so when I found these perfect peach and coral Ranunculus for a bride it was a match made in heaven. I tucked the Ranunculus in between white Roses in a random manner and it turned out looking whimsical and dainty and shabby chic all at the same time. This is one of my favorites! When you've got such a great bouquet, you want to finish it off just as well. I found this peach Muslin that was the perfect complement to the bouquet and added a rustic charm. Taking it another step further, I added twine in the center and it all came together. We mirrored the look in the Groom's boutonniere with two tones of Ranunuclus, Muslin wrap and a bit of the twine. A perfect pair! 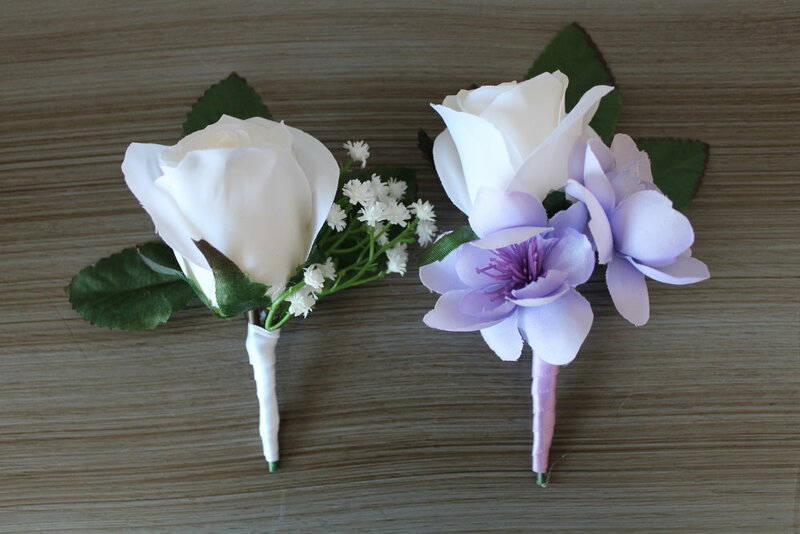 Corsages and boutonnieres in matching styles and colors enhance the overall picture that your flowers give your guests. While it may seem overwhelming to think about the designs for all those personal arrangements, you can leave it to me to come up with coordinating corsages and boutonnieres that will photograph well, hold up to all those hugs, and work with the design of your stunning bridal bouquet. Get in touch with me to order your coral and white silk wedding bouquet and hear more about the designs that can make it all work together.